Mt. 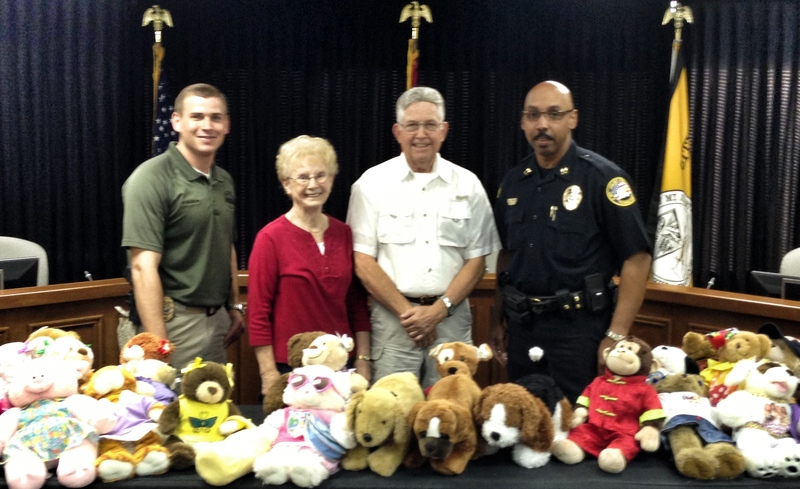 Juliet, Tenn. – Hoping to bring comfort to a child when needed most, Mollie Barr dedicates her retired life to building teddy bears of love for children involved in police-related situations. Wednesday, Mollie stopped by the Mt. Juliet Police Department with her husband Earl to deliver the furry critters for Police Officers to place in their patrol cars. Ready and prepared to serve, the bears will ride along with police officers during their tours of duty. During an officer’s shift, it is likely they will come across children involved in traumatic situations. The bears are available for the officer to give to the child, which will hopefully help put a smile on their face. When it comes to children, often the littlest things can have the biggest impact. Comforting a child at a time of crisis is a critical function of police officers. “In situations requiring police intervention, they are often traumatic and negative,” said Deputy Chief James Hambrick, “Any little bit helps and Mollie’s bears will go far in a young child’s eyes. Our department is so thankful to have Mollie Barr in our community who wants to make a difference in a child’s life. These are not normal stuffed animals. They are “Mollie’s Bears of Joy” because they are inspired from her heart with love. Mollie ensures they are in top-notch condition for a child who may need them. She spends her own money for the animals and even dresses them up. Prior to giving the teddy bears to the police department, Mollie stated she gave them their mission to make a difference in a child’s life. Mollie Barr shows off one of her bears inspired by her heart.